It is no secret that I enjoy firearms as well as knives. Having spent much of my life using tools in the projectile and bladed category this enjoyment is well founded. My first memories of shooting were having my father assisting me in holding his venerable 10/22 as we shot at a truck tire with a piece of cardboard in it that had been rolled across the barnyard, I was 3 or maybe 4 years old at the time. My review of the Colt LE6920 M4 carbine (and others) is a result of the love and respect instilled in me by my father. Colt began as a company in 1855, Samuel Colt, arguably one of the most influential firearms manufacturers and designers at the time already had several firearms designs under his belt. He is best known for the Dragoon, Ring Lever Rifle and the most famous old west handgun, the Colt Walker 6 gun. Obviously I am leaving out many valuable additions, however, this is a review of the more modern AR15 variant the Colt LE6920 M4 carbine. It should be noted that one of the chief benefits of the firearms he originally manufactured were the parts interchangeability and the production line approach to manufacturing. Henry Ford was not really the first, though he was the most famous in this regards. For anti-gun naysayers, there is a truly amazing history to be found, and many advances that were made in manufacturing, parts interchangeability, and metallurgy that directly impact all life in a positive way that came from firearms manufacturing. When I first got the Colt LE6920 M4 carbine I was underwhelmed, after all, I had just plunked down almost $1000 for a non-precision, non-hunting, defensive firearm. This is not small change for someone making under $25,000 annually. My opinion of the firearm was quickly changed by the reality/facts of the firearm itself. This is a very well-built firearm. While not as accurate as an LWRC or Daniel Defense premium model, it is very much capable, with good ammunition, of seeing 1-2 inch groups at 100 yards while benched and using only a sling rest I have easily put 30 rounds into a 3” circle with it. Lower and upper are made of 7075 aluminum and forged by Cerro (mine was, some may not be!) it is a low shelf lower. It allows mounting of optics easily with the standard 1913 rail on the top of the receiver. Though the handguard is standard patrol/ milspec approach, it can be swapped easily for a Magpul MOE for-end for added versatility. Accuracy was a mixed bag, this is the reality for most firearms. Even with modern machining and computerized approaches accuracy is flexible at best and depends on ammunition type, bullet weight, and even the sun, wind and whether the moon was full or not. Seriously, I have two very expensive firearms that shoot best on new moon months, (I am obviously joking folks). I found my LE6920 did best with MEN 56 grain NATO spec and Fiocchi 69 grain 223 rem. Both groups of 5 rounds with these loads were under 2 inches off of a sandbag at 100 yards, it was a clear day with a small breeze and it was hot. Standard Arizona shooting weather includes breezes, heat and a clear sky. My worst groupings with this firearm were with Federal big box 55grn and Wolf standard 55grn, both were over 4” with the Wolf loadings coming in slightly under the Federal. I should mention that I do not use bi-metal bullets in my firearms anymore. It is not because they are not reliable or accurate, which with some is an issue. Colt M4 Carbine – Note the Holosun Optic Sight (click here to read my full sight review). It is simply because when you calculate the heat of the round and steel on steel wear, the life of a barrel does, in fact, go down enough to make it difficult for me to justify even at 2-4 cents difference per round. I have worn out several barrels over the years, and simply do not enjoy replacing barrels before what I believe the lifespan should be. Reliability was very good, again this is sometimes an ammunition based metric. Of the AR-15s I use, this is among the most reliable one I have owned. Every single new gun I buy gets stripped down and cleaned before shooting. No factory lubrication on AR15s can make up for sitting on a shelf collecting dust while waiting to be sold. Take your gun apart and clean it well, than lubricate it per the accepted approach. I use 2-4 drops of Ballistol (click here to read my full-review of Ballistol) inside the channel where the bolt carrier group will ride, cycle the bolt several times to get the oil spread about well and add a couple drops to the side of the BCG you see through the ejection port. Cycle the bolt a few times again and go shooting. After around 50 rounds of initial use, remove the BCG and wipe it down, replace the BCG and put 2 drops or so on it. Then run it through the next 450 or so rounds. My standard initial testing is 500 rounds for reliability. This includes 3-4 magazines or 120 rounds as fast as you can pull the trigger, without a cool down in between. This stage is essential as fast, high rates of fire will raise the temperature substantially and will quickly show problems if they exist. While I have never found a perfect firearm as far as reliability is concerned, this one is very close to that. In fact, I did not have any issues until I was over 1000 rounds in with it. It had begun cycling sluggishly and failed to eject a round, and I quickly remedied this and have not had any non-ammunition related issues since. Shooting this firearm is not difficult, though the trigger leaves a bit to be desired. It is a milspec trigger, nothing special and allows function well. The premium trigger from Palmetto State Armory is much better feeling, though, the Colt trigger works very well. It is very easy to polish the trigger, or just shoot it a few hundred times and it will polish itself. As with most well made defensive firearms, I do not suggest adding things to it, this approach leads to more failures than any other. If you want a sporter AR-15 with a 2lb or less trigger and sub moa groups, build one from scratch. This particular gun is designed for use as a defensive tool and excels at the role! Negatives are quite a few in actuality. From the factory, there is no ability to mount a light, something I really need on my defensive tools. Additionally, it is very expensive for what amounts to being a standard, well made, but a still standard milspec firearm. If you have the money, or if you are not looking to collect multiples of this type firearm and just need one good performer, this is the tool for you. However, if you are outfitting more than yourself and like myself make substantially less than Bill Gates, there are other choices that will function perfectly well and do the job for substantially less. My only other real complaint is that for the money you spend there is no reason that Colt does not manufacture all parts in-house, they do outsource many of the major parts for this and other firearms they sell. None of the “issues” are really a problem, except for people who nitpick, like myself. 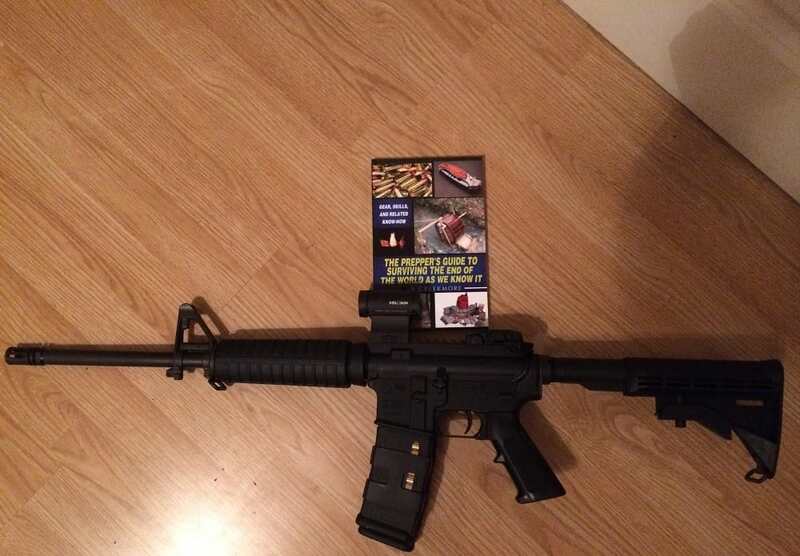 Overall this is a firearm that with a little care from you, can be passed down to your children. It is well made, durable and on the higher end of cost, but not exorbitantly so. I can recommend the Colt LE6920 M4 carbine with two thumbs up and would not feel under armed using one for personal defense or for patrol as a combat person. There are other versions of the 6920 available and right now is really a buyers market for firearms of all types. Be sure to comment below if you have had any experiences with a Colt LE6920 and let us know. As I have only used this one carbine, I cannot speak to the overall ability of the 6920 series. Again, comment below and let me know how yours run.